Description: Collection of Tablets of Bahá’u’lláh mostly to individuals named at the start of each Tablet. Each Tablet has an annotation indicating that it has been compared with the original. 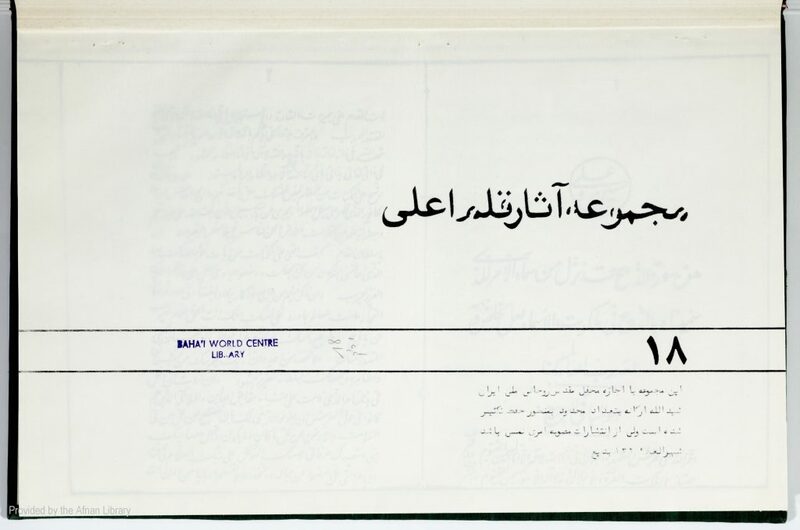 The Tablets up to p. 24 also have a stamp of the Spiritual Assembly of the Bahá’ís of Tehran. Most of the Tablets have a named addressee and those that are recognizable are from various localities including Tehran, Káshán, Ardistán. Tablet of Contents at end of volume, pp. 283-297 of PDF. Manuscript 561 + 29 pp. (198 pp. of PDF).